A few days ago, I was pondering a gift for my friend's birthday. 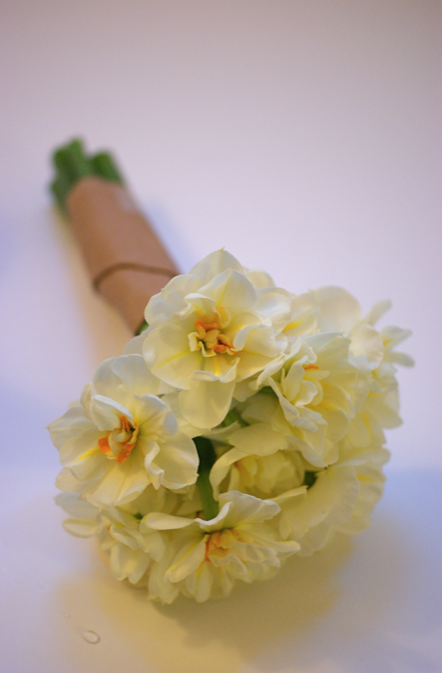 I wanted to make her something special to go with some lovely narcissi and an amusing card we had bought for her. I had some spare chocolate pastry cream from the Gooey Chocolate Meringue Stack so I was contemplating how I could incorporate this into my gift. I didn't want to give her a big cake but a few smaller things, like cupcakes. The pastry cream is quite runny so I felt it would be a bit annoying on top of cupcakes, and I didn't think it would bake well as a filling inside cakes and it seemed a shame to not do something special with it. In the end, I decided that little tarts were just the thing. 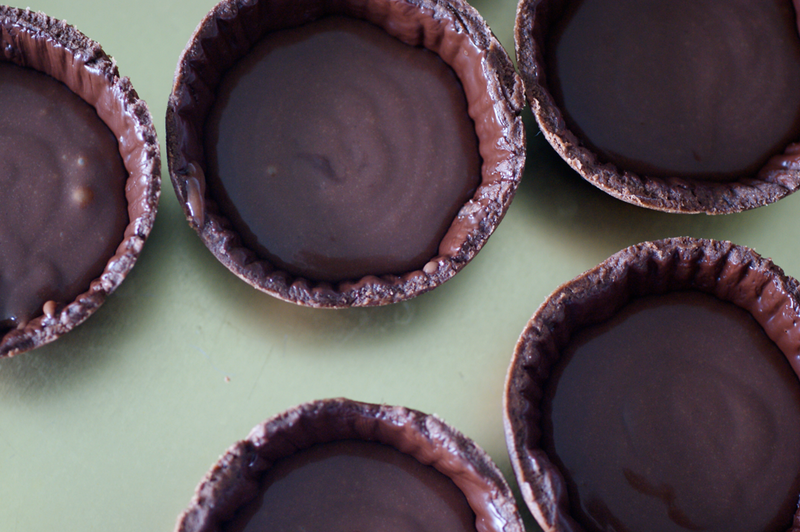 I could make little chocolate pastry cases, paint them with melted chocolate to stop the pastry cream making them soggy, and fill them with that delicious cream. It almost reminds me of very very thick yummy hot chocolate. On top of this, I decided to put some white chocolate ganache, for a bit of a colour change and a different flavour. I was a little worried it would sink but when I piped it on and then smoothed it over it was fine. On top of this, to seal it all in, I poured melted chocolate and then let them set in the fridge. The result was yummy, if a little messy to eat (as one of my friends found out, when trying to eat one standing up in my kitchen - needless to say, the floor needed mopping afterwards). 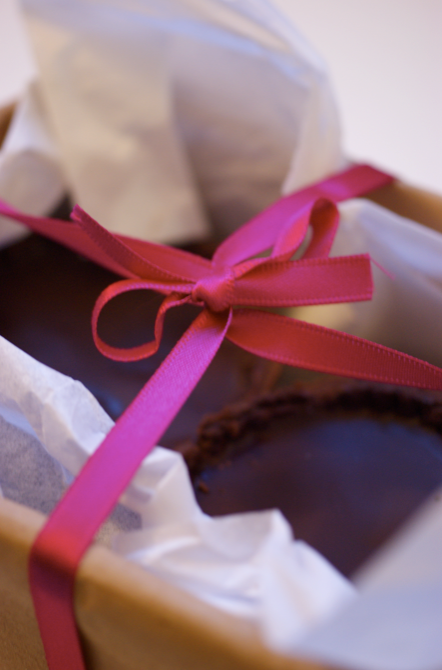 They're not too sweet - the pastry and dark chocolate counteract the sweeter pastry cream and ganache. Still, the small portion size is good as it comes together to be really quite rich. Happy Birthday to B - you'll always be my bow! Place the butter in the freezer while weighing out the flour, cocoa and sugar into a food processor, then chop it roughly and add it too. Blend until totally incorporated. Slowly add a very small amounts of cold water into the processor until it comes together into a ball. Wrap the ball in cling film and place in the fridge for 30 minutes. Roll out on a floured surface into a rectangle then cut out circles that fit into a muffin tin. Press these circles into the tin and scrape off the tops so they are even. Insert a cupcake/muffin case into the pastry cases and fill with baking beans. Bake blind for 20 minutes then remove the cases and beans and bake for a further 5 minutes. 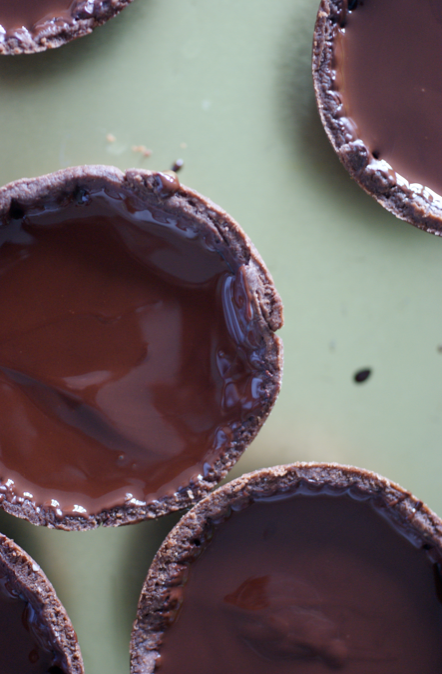 Melt the dark chocolate then brush the cases with it once they have cooled slightly. Then take out of the cases and let them cool out on a wire rack. Beat the egg yolks and sugar together, then add the flour and cocoa and beat well to incorporate. Warm the cream and milk in a small saucepan then add half to the egg mixture, beating well with a whisk as you go. Return to the rest of the milk/cream mixture in the pan and whisk again. Bring to the boil, stirring constantly until it thickens. Take off the heat and remove to a bowl to cool, topping with greased baking parchment to stop a skin forming. Don't put it in the fridge. Chop up the white chocolate and put it into a small bowl. Heat the cream until nearly boiling and then pour over the chocolate. Leave for a few minutes then beat in until smooth and leave to cool slightly. Spoon the pastry cream into the painted pastry cases until they are about half full. 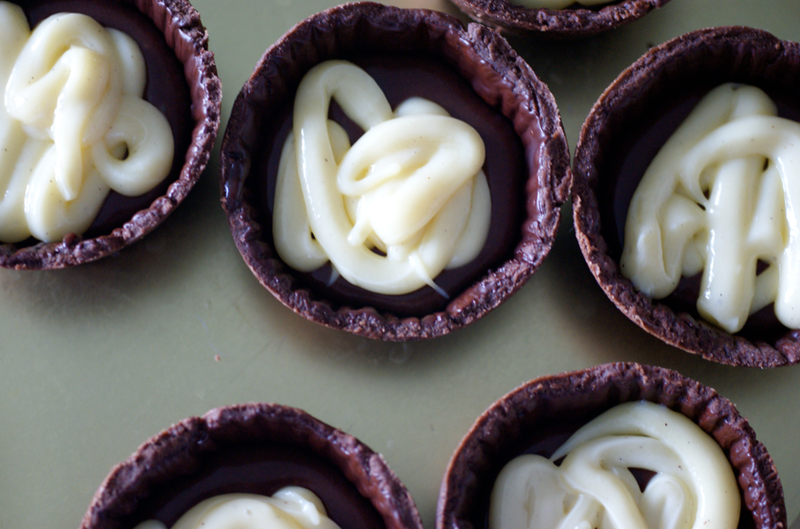 Pipe or spread the white chocolate ganache over this and place in the fridge for five minutes. 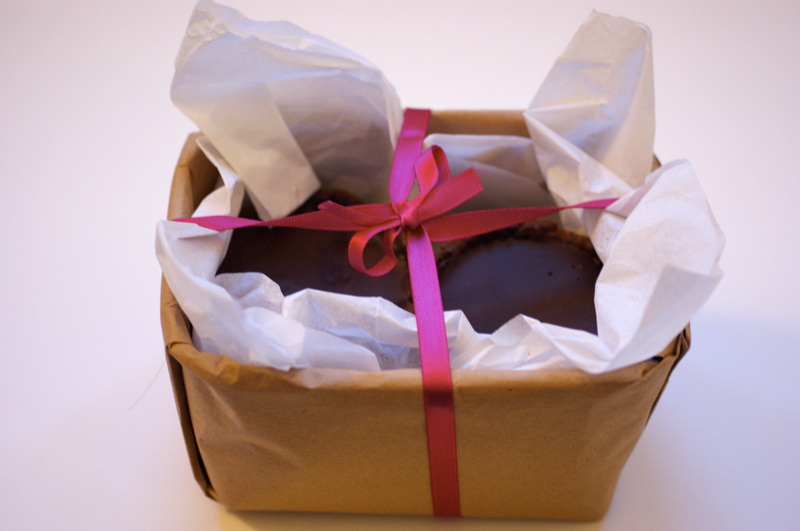 Melt the dark chocolate then pour it over each case, making sure it reaches every edge. Put into the fridge for 20 minutes or so until the chocolate sets on top. MMMMM these look delicious! I can imagine how messy they were to eat, look how gooey they are!! What a great idea for a present. They were absolutely divine :-) Thank you so so much. And the blog is rather beautiful - interests in cooking and photography is definitely a good combination! 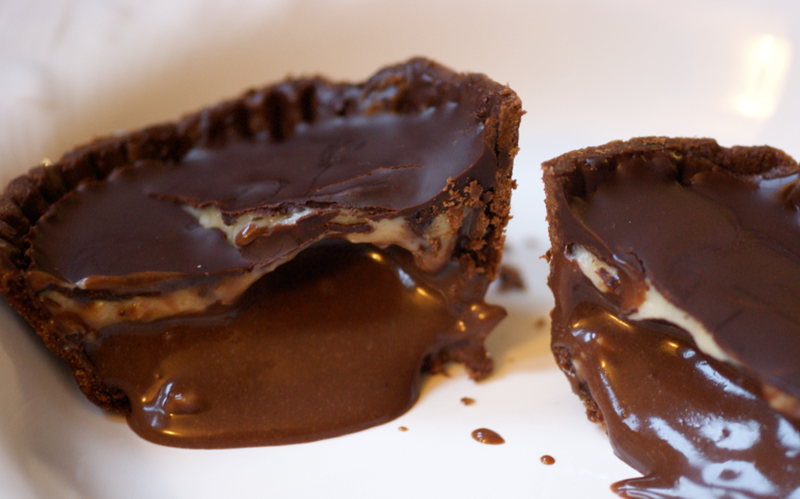 Oh wow I cant believe how amazingly good these look, yummm chocolate overdose heheh :D.
Nice blog. Nice food. I'm diggin' it. Hope to read more good posts. Keep it up. What a treat ! And a lovely birthday gift ! If I let you know when its my birthday could you make me a batch too please????? 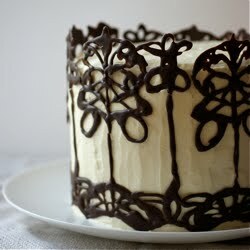 Yum--that was a very creative use of the leftover chocolate pastry cream.Your friend is very lucky to know you! I had a similar messy incident involving hot scones and cream the other day. Thankfully I was wearing an apron so my tshirt was saved but alas my jeans, shoes and the floor copped it. I might try a variation on this for a baby shower next month. that looks like a divine bird nest although it is a chocolate tart !!! ωе're in Monday, many duets letting back together once more. beatmakingsoftwareblog.Com When you reply to you? The donations too seem to make other common peoples.